I love being stopped in the street and told creek stories and shown photos of different creeks on people’s iPhones. No, listen: I really do like it! The only trouble is knowing what to do with all this information. I feel a certain responsibility but I’m uncertain about where to go with it and how to treat it. So, until I figure it out, I’ve created a Facebook page called Down the Drain. 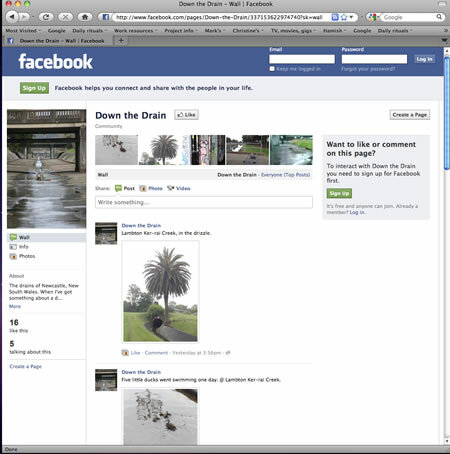 It’s a place for anyone to post their own pictures of drains, creeks and waterways in and around Newcastle. Look forward to seeing your contributions! Ive just come back from paddling along the edge of Koragang Island, and thought of you when we found a tiny creek meandering through the mangroves that must be a bit like what Styx Creek was before urbanisation. We started paddling up it under the shade of mangroves then came out into grasslands where it meandered along between muddy banks full of crabs. I could take you there if you want to see it. You’re on! It sounds gorgeous, a perfect place to be a on balmy February day. Do you have a two-seater or a spare kayak? I never got to meet Styx Creek tho I must have crossed it daily as I peddled (or motored) across the Griffith Road bridge on my way from Cooks Hill to Mayfield to work in the early 1980s. And I’m not likely to do so soon. However as another ex-Alice Springs-moved south person I’m now likely to get to Hamilton North more frequently. The real reason for the post however is to say that, like Ben, the book has inspired me to look at other creeks aka drains from a new angle. In Alice the Todd provided a community, cross cultural focus when it flowed. Each flow was a major event and everyone turned out to witness and play in it. But other Alice drains provided a walk way behind the facade of houses that usually lined them, giving one a look into back yards and living rooms (another McLean past-time??? :)), or out onto the surrounding natural environment for relief and re-charging. Now in Canberra, we have several local creeks that have become storm water drains along which the bike ways wander. Areas are presently being reclaimed as wetlands. I haven’t adopted one yet; Sullivan’s Creek that runs down central north Canberra was a focus for my time at ANU in 2010. Its seasonal and wet-dry cycles provided similar fascination to that described about the Styx. Perhaps … although not having a small animal to walk (cavies don’t count) and being even less likely to do a journal of any kind, I’ll just observe unrecorded. Bruce and Lou were telling me about the Canberra creek rehabilitation project. I’d love to see any pictures! I agree about the Todd; in fact, I’ve got a post coming up about a collection of empty casks that Vicki Gillick and a few others organised. I met you on the ride with Dr Behooving. Thanks for that link: an absolutely brilliant story! Hope to catch up on the next ride, whenever and wherever that is. Can’t find your number on my phone either, Murray! Mine’s 0419 04 02 09. Morning or evening walk? Brilliant, Mick. As you’ll see from the blog, the new generation is keeping the spirit alive! Thank-you for your reply Mark , keep up the good mate cheers ! Hello Mark. After hearing you on ABC Radio yesterday, I have just had a good ramble through your blogsite. Thanks for the birds, the rubbish, the graffiti, the abandoned industrial sites and your free-flowing commentary. I will be back for more of your guided strolls around Hamilton North. Had a look at the Pavement Graffiti blog: very interesting. Being English I often wonder how much the whole drain/creek/canal thing is a Newcastle phenomenon or something that happens in all Australian coastal towns and cities. It does seem to be more widespread than I’d ever imagined. Thanks for the link, and the nice comments! If you’re interested I blog about Newcastle (and other stuff), though I’m more the iphoneographer taking pictures of the city when I’m out and about. So THAT’S what goes on in the old light-globe factory! A very interesting snoop through your many blogging guises! I know what you mean about Ham North and P2P – it really is like nowhere else. I rather fancy myself as Stanley Holloway too: “Sam! Sam. Pick up thy musket”. I’m not much of a blog follower, I prefer to just turn up every now and again to see what people have been up to, but as of today you’re on the Good People list.